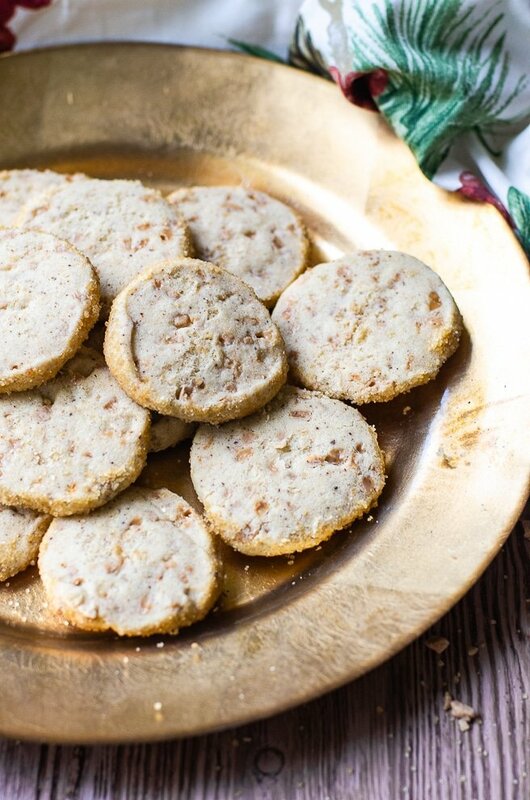 Shortbread cookies are a quintessential holiday season treat. This easy shortbread cookie recipe is great for a cookie exchange or an evening indulgence. Make sure to make a double batch, though. They’re that good! Shortbread cookies are a delectably crunchy and buttery cookie that is often associated with Christmastime. These lightly golden cookies practically melt in your mouth and are hard to put down. Do I Have to Make the Brown Butter for This Shortbread Cookie Recipe? There is no real mastery of skills needed for this shortbread cookie recipe. However, any of these articles below will help you become the best baker you can be. In turn, it will help your shortbread cookies turn out that much more amazing. How To Brown Butter. Since this is an essential part of this recipe, I recommend reading this. It explains everything about how to separate the dairy to how dark it should be. Creaming Method. This is the baking method used for this shortbread cookie recipe. It goes into detail about the order you add your ingredients and why this is important for success. Shortbread cookie dough is incredibly easy to store. In fact, it will stay fresh in the refrigerator or on the counter for three to five days. Just make sure it is tightly sealed so it doesn’t dry out. Also, if you love these as much as I think you will, the recipe doubles easily. If you want to freeze some for another time, they will stay good for up to a month. Since you will most likely shape the dough before freezing, I recommend wrapping the dough in parchment paper before the plastic wrap. The parchment paper won’t stick to the dough, so it releases easier when you’re ready to cut them. Once your cookies are made, they will stay good in an airtight container for up to two weeks at room temperature. Since most of the water evaporates when you make the brown butter, the cookies are unlikely to go stale. I’m going to be honest with you. Cutting shortbread cookies isn’t a big deal if they’re refrigerated. Frozen shortbread cookie dough is a completely different story, though. Many recipes are designed for the frozen dough to be put right into the oven. However, they tend to crumble in the center when you slice them. Even if you’ve give the dough time to thaw. Nobody wants that. If you are freezing the cookies, my recommendation is to cut them after chilling, but before freezing. You can layer the slices between small sheets of parchment paper before storing them. This will make them more like “break and bake” cookies. It will also let you determine how many you would like to bake at a time. Side note: If you make your cookies round, your dough will probably flatten on one side while it chills. Don’t worry though, as long as you only do the single hour of refrigeration, this is easily recoverable. After you’ve cut the shortbread cookies, use the heat of your hands to gently shape the cookies individually. This will also help the turbinado sugar stick better when you roll the cookies in it. Can I Make These Shortbread Cookies Ahead? Yes, absolutely. One of the unique features of this recipe is that the brown butter reduces the amount of water in the dough. This means that the cookies can be baked one to two weeks ahead, but not go stale before eating them. (This also makes them a perfect candidate for your next cookie exchange!). If that makes you a bit uncomfortable, you can make the dough up to three days ahead. Keep it on the countertop or in the refrigerator until you are ready to use. The dough will harden up quite a bit in the fridge, so make sure to let it thaw a bit before using. I did learn the hard way NOT to roll the shortbread cookies in the toffee pieces. When they are left on their own without the protection of the dough, they melt quickly. They also melt away from the cookie. This makes the toffee pieces extra crunchy, and the cookie very funny looking. One of my favorite ways to get toffee pieces for this shortbread cookie recipe is to buy real toffee. There is almost always a bunch of toffee crumbs left in the bottom of the canister. (This is my absolute favorite!) If you’re feeling up for it, you can make some yourself and smash the candy into small pieces. Lastly, you can get some in the baking aisle of most grocery stores. Heath sells small bags of toffee bits and those can usually be found near the chocolate chips. To get a really spectacular covering of the turbinado sugar on the outside of the cookies tilt the bowl towards you. Roll the cookie through the “corner” of the bowl until fully coated. This helps get the side entirely covered with the sugar. Want a free printable grocery list for this brown butter shortbread cookie recipe? Get it here. 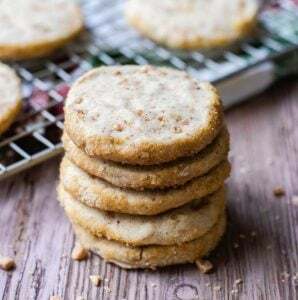 These melt in your mouth brown butter shortbread cookies are a perfect treat with coffee or a cocktail. In a food processor or bowl of an electric mixer, cream together the brown butter, powdered sugar, and salt until smooth. Slowly add in the flour until everything is combined, scraping down the sides as needed. Fold in the toffee pieces with a rubber spatula. On a lightly floured surface, shape the dough into an 8-10 inch log. Wrap it in plastic wrap and refrigerate for one hour. Place the racks in the upper and lower third of the oven. Preheat the oven to 350°F. Slice the shortbread cookies into 1/4" pieces and roll the edges in the turbinado sugar. Transfer them to two parchment paper lined baking sheets with 12-14 cookies on each pan. Bake for 16-18 minutes, rotating the pans halfway through. Let the shortbread cookies cool for 5 minutes before transferring to a cooling rack. I can just imagine how good these would taste. I made cookies for the first time with brown butter on the weekend. OMG they were delicious. I know these would be a hit on the holiday treat tray. Doesn’t the brown butter really add a little gourmet boost to the cookies? It’s such a fun treat to add to a cookie exchange or treat tray with not a whole lot of extra work. There’s just something about buttery shortbread cookies that gets me every time. You’ve taken it up several notches with the toffee — I can just picture myself cozied up on the couch with a cup of tea and a plate of these beautiful shortbread. If there’s any left, I’ll share them on the holiday cookie platter… IF. IF, is definitely how I feel as well, Lisa. 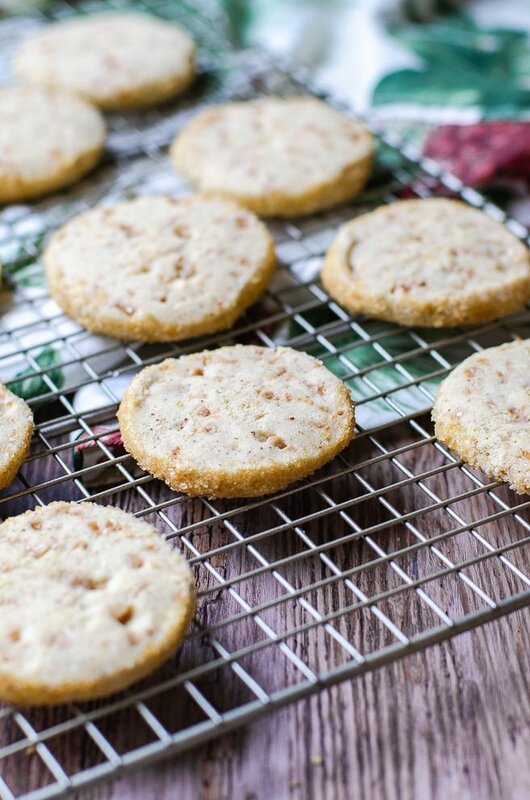 The flavors combination in this shortbread cookie recipe is phenomenal. I could sit and eat the whole plate myself very easily. Not a toffee person, but I would love to try the plain shortbread recipe. I am so obsessed with brown butter. Pinning this for later, I’m curious to try my hand at this! 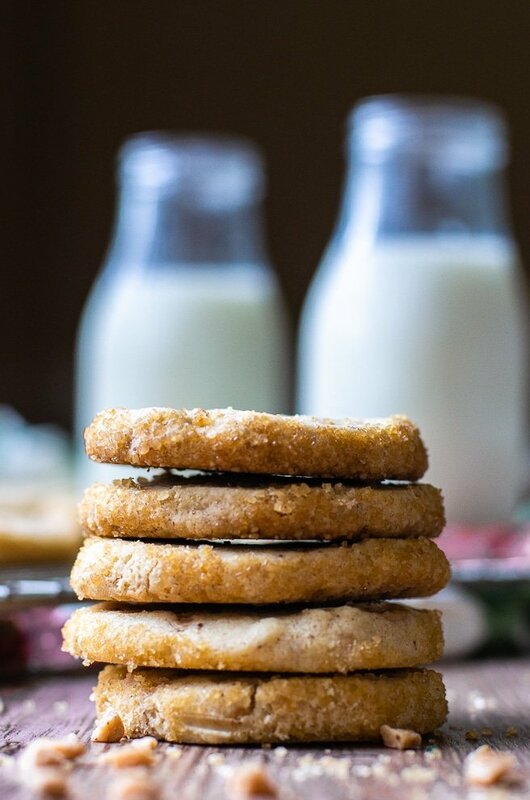 Even as just a plain brown butter shortbread cookie, this recipe is amazing. Plus, I love all the beautiful little speckles that the brown butter decorates the shortbread with! These look absolutely perfect! I love baking and cooking with browned butter. It adds such a nice nuttiness to baked goods! Saved! So true, kiki. Brown butter is one of those foods that I see on the ingredients list, I’ll almost always succumb to and make/buy. Love the rich flavor profile. These sound delish. Thanks so much for the tip on the toffee pieces. I will definitely learn from your mistake! Glad you were able to take one for the team! Hahaha! I wish I had a picture of the shortbread cookies to show you. The toffee melted all over my pan and was a very fun, but delicious mess! OH!! I love brown butter anything!!! Shortbread is also the best this time of year!!! Combine the two and you definitely have a winner!!! I love how brown butter is such a simple substitution, but makes a terrific impact in flavor! Oh my gosh you were SO right, browning that butter was totally worth the extra time. It was PERFECT with the toffee. My coworkers flipped over it – they said they were the best shortbread cookies they’ve ever had – thank you!! This makes me so happy to hear, Tracy. I’m doing a happy dance! I’m so glad they loved this recipe! I’m obsessed with brown butter, so these cookies are going on my list of things to bake this week. And I love that you can double the recipe and freeze them for later! I bet they would make a great gift too! These are perfect for giving as an edible gift because they stay fresh for longer than most cookies. They are superb. I’m with you on a love of shortbread cookies, so I’m all about the “break and bake” so I can enjoy them whenever I’m craving them, but without overindulging. This recipe is stunner! You had me at shortbread and won my heart over with the brown butter. I love how you explain every detail in this post too, and those gorgeous photos make me want to reach in grab one, or four. So glad I’ve found my new shortbread cookie recipe! Thank you so much, Traci. I feel the way about shortbread cookies, and once I started making them with brown butter, I could never go back! I am all about shortbread cookies lately and am always very into toffee! And that brown butter?? omg these sound ridiculously delicious! They are so velvety and practically melt in your mouth. The brown butter adds such depth and flavor! We love anything that has brown butter included in it. Just that extra step gives any dish an added richness to it. These cookies look like they’d melt in your mouth. I’m saving this recipe to make for an afternoon gathering I’m planning. I hope you love the recipe, Marisa. It’s definitely a big hit everywhere I’ve taken it. Omgggg I can taste that winning brown butter and toffee combo already. Amazing! Shortbread is one of those things that can be enjoyed in its simplest form, or jazzed up. And I’m all over this jazzed up version here. This + a hot cup of coffee? Heaven. I’m all for these shortbread cookies and a cup of coffee. What a fantastic way to end (or start) the day! Oh wow, do these cookies look heavenly. We absolutely LOVE brown butter and your step-by-step post for making brown butter is really nice. I agree these cookies are perfect for the holidays, but I’ll be making these year round. These with a nice big glass of cold milk is literally making me drool at the moment. Thanks for the awesome recipe, photography, and detailed instructions. Superb! It is totally worth the extra time to make regular butter into brown butter! The flavour is definitely elevated when brown butter is involved. I never thought to add brown butter with toffee to make cookies thougt, that is such a fantastic and delicious idea! Brown butter and toffee pair so nicely together. 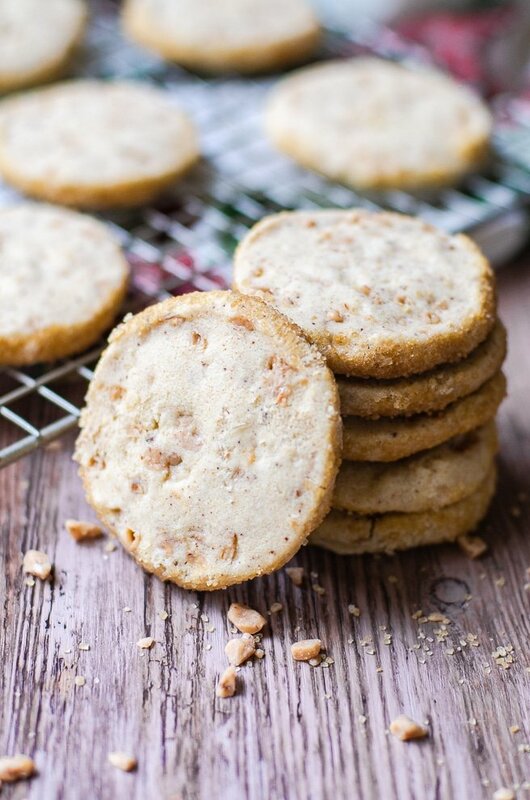 Once you try these, you’ll never eat basic shortbread cookies again! Yes! After Christmas I always find myself craving cookies and need some small amounts to wean myself off of the dessert heavy December. These are perfect for it. Not too sweet.